Northern Ireland’s leading business education charity, Young Enterprise, led a group of 36 students aged 13-14 through an exploration of scientific industries recently with their Science Masterclass at St Columba’s College, Portaferry. The programme, gave students the opportunity to look in depth at careers available to them within the scientific industries through a series of fun, hands-on activities. The young people at St Columba’s College explored a range of common job roles that require scientific experience then conducted two practical scientific tasks including a “CSI:NI” robbery investigation and a sports science experiment. The aim of the programme was to give young people an insight into the range of jobs that are available to them and to consider their future career options. 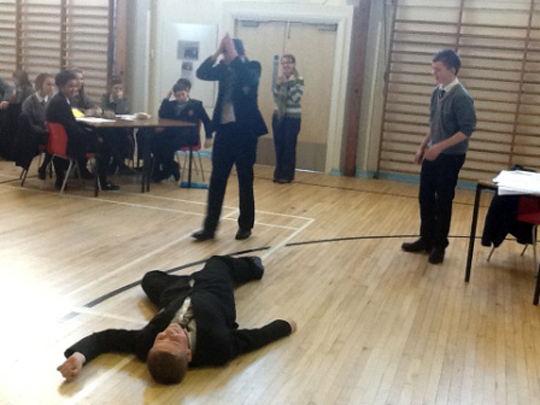 A CSI-type investigation at Portaferry’s St Columba’s College.